We look back with great pleasure on the pilot that Qredits has just completedd in collaboration with the Albeda College, the municipality of Rotterdam and the Dutch Council for Refugees. With the EigenBaas Migrantenprogramma an inspiring process has been set up to inform migrants about entrepreneurship in the Netherlands. With the help of the EigenBaas Migrantenprogramma entrepreneurs learn how to draw up a business plan, what a financial plan looks like, but also for example how to file a company tax return in the Netherlands. Last Tuesday marked the end of the twenty lecture weeks where participants received their diploma. For some entrepreneurs, the evening was extra special. Participant Melanya wrote a very strong business plan during the process and wanted nothing more than to start her own business. In order to be able to do so she needed a loan for which the Armenian native had submitted an application to Qredits. 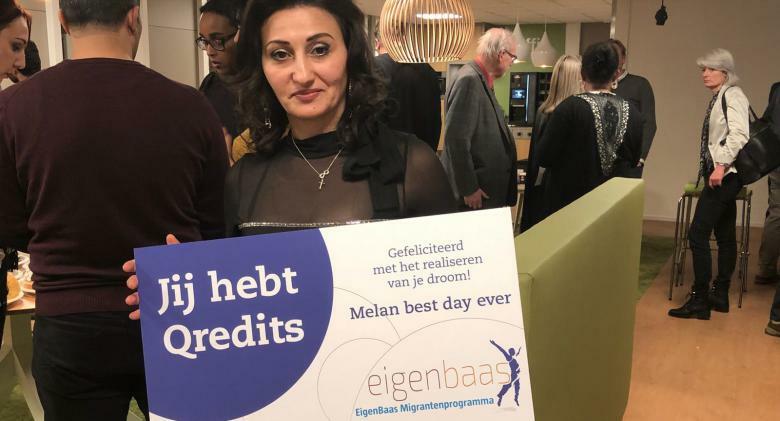 At the end of the festive evening Qredits CEO Elwin Groenevelt was honored to surprise Melanya with her loan approval. This cleared the way for the event planner / patissier to start her own company. After 20 weeks of training, coaching and following an e-learning course, no less than 5 entrepreneurs from the 13 participants actually started their own company. The other participants are not ready yet, but have taken enormous steps in developing their plans. A wonderful result for this pilot. Qredits is planning on duplicating this succesful program in other Dutch municipalities in cooperation with the Dutch Council for refugees and local city government.